TAKE CHARGE OF YOUR WHOLE HEALTH. DO YOU WORRY ABOUT URINARY INCONTINENCE OR LOSS OF SEXUAL SENSATION? Bella Viságe is more than just your home for aesthetics — we focus on total wellness, rejuvenating your beauty from the inside out. We want all of our clients to feel confident in their bodies and know that no matter what stage of life they are in, we are here to help them take control of their health. As a family-owned business, we are dedicated to creating a community of clients who know they can trust the services we provide. Visit us to find out about the treatments we offer for urinary incontinence, other symptoms of pelvic floor weakness and so much more. 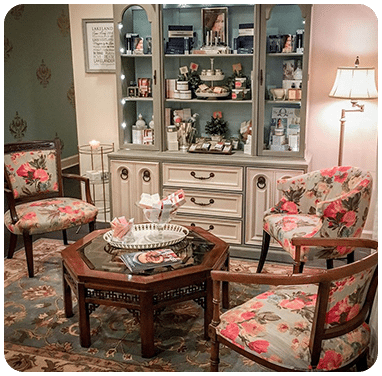 Schedule your consultation today at our beautiful, comfortable medical spa in Lakeland, Florida. Our clients with concerns about urinary incontinence have access to one of the top treatments on the market: Emsella from aesthetics device company BTL. Emsella has revolutionized the industry for treating urinary incontinence and improving other symptoms of pelvic muscle weakness — it’s the only completely non-invasive approach with proven results. Its innovative chair design allows clients to relax during their treatment, remaining fully clothed and leaving their appointment completely able to resume all normal activities. Emsella offers a convenient, simple solution to symptoms that many people don’t even know they can treat. Find out more about what Emsella can do for you during your consultation at Bella Viságe. While you relax in the Emsella chair, the device sends pulses of high-intensity focused electromagnetic (HIFEM) energy into the muscles of your pelvic floor. The HIFEM energy waves trigger rapid muscle contractions over the course of your 28-minute treatment — the equivalent of up to 11,000 Kegel exercises. Most clients — an estimated 95% — note significant improvement in their symptoms after their Emsella treatments, sometimes after just one session. Reported results include increased bladder control, vaginal tightness and sexual sensation. To learn more about Emsella in the Central Florida area, schedule a consultation with the Bella Viságe team today. Call us at 863-209-7869 to make your first appointment.